BulbsCanada.com Inc. always put your privacy and payment card safety on the first priority place. Every time after you confirm an order on our website, you will be automatically re-directed to Paypal.com through a most safest link (SSL), Paypal.com the No. 1 and the biggest Online Payment Solution Provider in the world. Paypal provides 2 options for you. Option 1. You pay through your Paypal account. 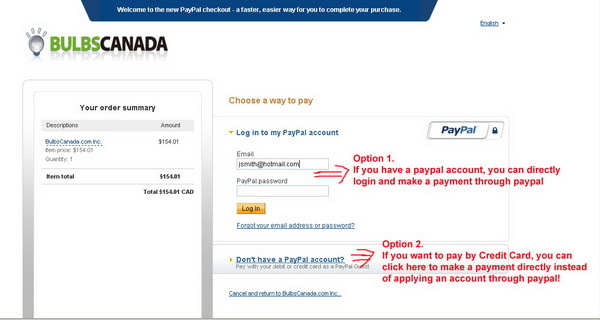 For Option 1, you have to set up account from Paypal.com first. After that, you can make a payment with the money from your checking account, saving account, Visa Card, Master Card, American Express Card. Option 2. You can directly make a payment by your Visa Card, Master Card, Amercian Express Card through Paypal.com avoiding the steps to apply a Paypal account. Which is most convenient for most of our customer. The following picture explains how to make a payment for above two options.